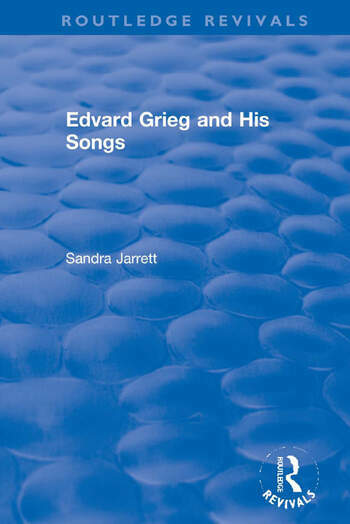 Originally published in 2003, Edvard Grieg and his Songs examines the lifetime of Edvard Grieg. His songs were among his most popular and well-known works and both historians and critics have seen in them, Grieg at his most sophisticated and innovative. Important in and of themselves, the songs also illuminate critical aspects of his other works such as his musical impressionism, his use of folk music as a source of inspiration, and his novel approach towards harmony. Fifty of Grieg’s most important songs form the focus of this book. Each song is discussed individually and within the wider context of the composer’s output. The book provides a translation of the lyrics, and analysis of the poem and a description of the song’s form, melody, tessitura, harmony, rhythm and accompaniment, together with suggestions for interpretation. In addition to this, the book gives a brief biography of Grieg, with a chapter that analyses his approach to song writing.